There’s an emerging group of developers that use computer science to express their creative vision, such as artist Zach Lieberman exploring audiovisual expression and artist-duo Varvara Guljajeva and Mar Canet, creative developers that use code to create visual art. Watch the DevArt intro video to get an idea of what it’s all about. See more DevArt on their Gallery. 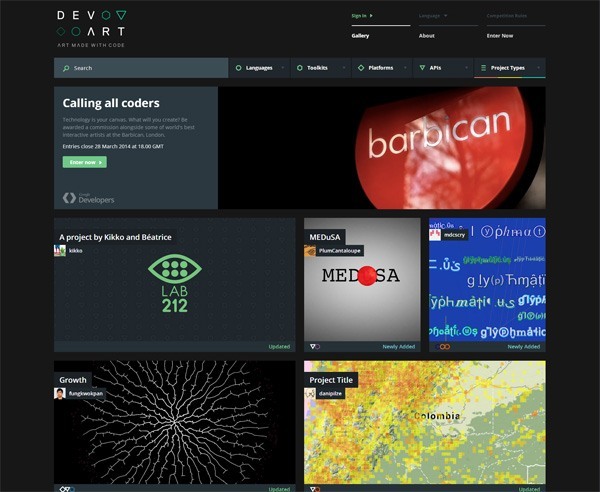 Google is running a DevArt competition with various prizes; the top prize being £25,000 (equivalent to about $41,000) and a commission for a digital art installation in the Digital Revolution exhibition at the Barbican in London. Learn how to enter the competition on Google’s DevArt site. You’ll need a GitHub account. Deadline is March 28, 2014 so better start coding!